The "Transparency Exporter" plug-in replaces, during the export, a (background-) color by transparency, all from within Lightroom. No need to open the exported photos in an other application. The final image is stored in the PNG format. The actual conversion is done by ImageMagick which is embedded in the plug-in. The screenshot below gives you an impressions of its options. Further below they will be explained in more detail. "Transparency Exporter" plug-in - What problem is solved? Demo of the "Transparency exporter"
Default Lightroom has no ability to convert the background of an image to transparency. Always you would have to export your images with Lightroom and then open them in a different application like Photoshop to convert the background to transparency. Now converting a (background-) color to transparency is integrated in the normal Lightroom export task. Converting to transparency has never been so easy! No need of buying and stepping out into other tools / programs. Download the trial version and experience for yourself! This version always you to convert five images each run. This plug replaces a specified color by transparency during export in Lightroom. The resulting image is in PNG format. Behind the scenes the converting is handled by the famous ImageMagick library (no installation needed). You can choose whether a color in the whole image is replaced, or using flood fill. So starting at a specific point and replacing as long a adjacent pixels are found with the (near) same color. See below for more info. For Apple MacOS, you have to install the latest version of ImageMagick yourself, see more info below. The plug-in is an "Lightroom Export task", that integrates as an extra tab into the Export process. Like always, in Lightroom you select your photos to be exported. In the Export dialog you specify your settings. At the end of the dialog, there is an extra tab where you can set the specific settings for the conversion to transparency. While exporting, Lightroom first exports the images to the location specified. 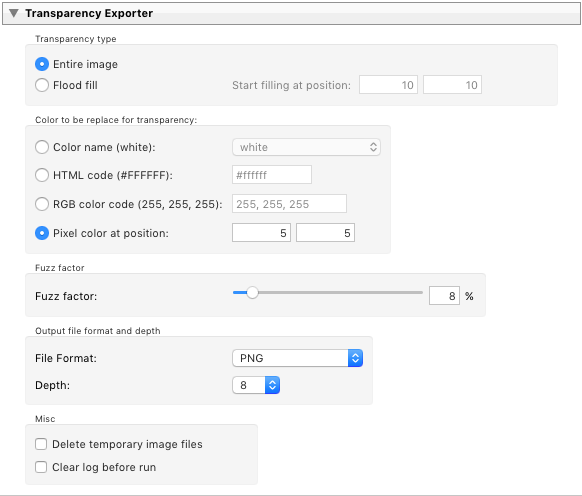 After all images have been exported, the extra "Transparency Exporter" task handles these exported photos to ImageMagick which converts and saves a copy of the images as PNG file in the same location. ImageMagick is embedded in the plug-in, no installation needed! As the title indicates, the color you choose will be replaced by transparency in the whole image. Flood fill colors an entire area in an enclosed figure through interconnected pixels using a single color. It is an easy way to fill color in the graphics. Btw, using the "Fuzz factor" the plug-in will also convert colors that are nearly identical! This option give much better results because the actual color will be retrieved. For Apple MacOS, you have to install the latest version of ImageMagick yourself. For more info see. The Fuzz factor allows for matching similar colors. Another color will be treated as being the same as the color being looked for, if the difference between these colors is less than the fuzz factor setting. In real world color are not always exact. The fuzz factors helps to select no only the exact same color, but also nearly the same colors. Experiment with this factor for the best results. In this section you specify the file format and color depth of the image file containing the transparent background. At this moment only the PNG file type is available. Contact us if you need a different format and we will investigate the possibilities. Further you can specify the color depth. The final size of the file with the transparency is largely defined by the general Lightroom export settings, like shown below. As described above Lightroom first performs its normal export process resulting in an exported file. This export file is handed over to ImageMagick which in turn creates the PNG file with transparent background. 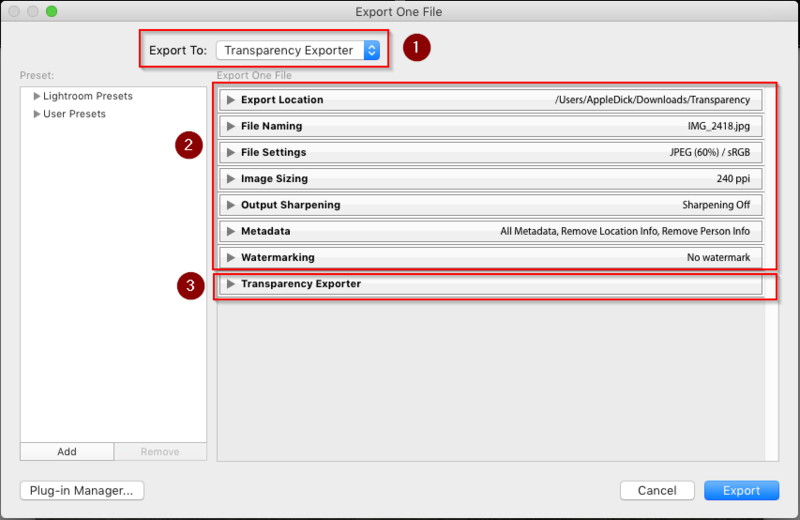 The option defines if the default export file of Lightroom should be deleted after the conversion to transparency or not. 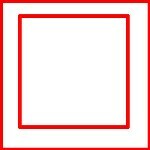 For the Apple MacOS platform all functionality is default available with the embedded version except for the retrieval of the color at a certain pixel position. If you do want to enable this functionality on Apple MacOS, you have to install ImageMagick yourself. For more information see the installation instructions.